Chess expert. No details of his life can be obtained. The name is probably Provençal, and he lived certainly not later than the fifteenth century. Bonsenior was the author of an interesting work on chess, entitled "Melizat Seḥoḳ ha-Ishḳaḳi" (Essay on Chess-Playing), first published at Mantua in 1557. It was translated into French by Leon Hollaenderski, and published, together with Ibn Ezra's "Ma'adane Melek" on the same subject, under the title "Délices Royales ou le Jeu des Echecs, . 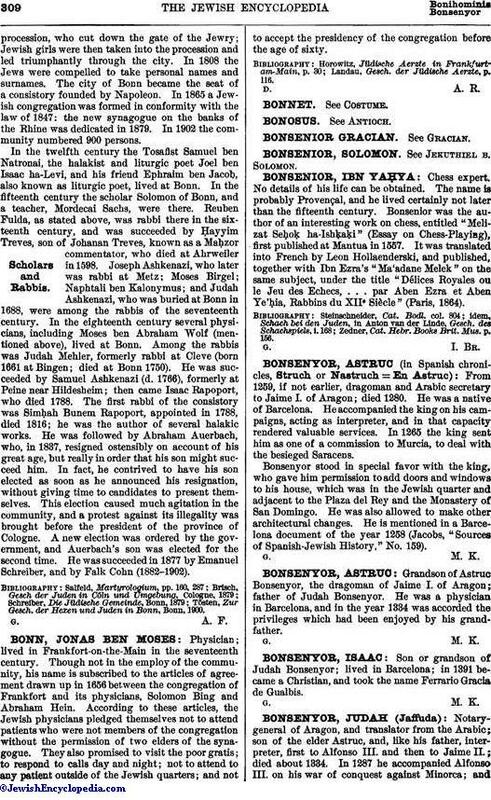 . . par Aben Ezra et Aben Ye'ḥia, Rabbins du XII⊇ Siècle" (Paris, 1864). Zedner, Cat. Hebr. Books Brit. Mus. p. 156.